By request, here're some simple instructions aimed at beginners. There're lots of different meditation styles. Mine happens to be most similar to the Zen tradition, but they're all aimed at the same goal, which is opening the heart. 1. Setting. Go somewhere relatively quiet, indoor or outdoor. Turn your phone off or put it on vibrate at the very least. I like to meditate in a room that isn't too cluttered and distracting. If you choose to meditate in your own room, you may want to keep your room tidy. You should do that anyway, says your mom. 2. Legs. If you need to sit in a chair, that's okay, but I much prefer to sit on the floor, either on carpet or on a folded blanket. 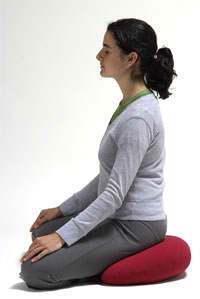 I sit a little elevated, on a cushion about 4 or 5 inches off the ground. The cushion doesn't have to be anything special. A hard, folded pillow usually works just fine. My right foot rests on my left calf, like the guy to the left, and both my knees touch the floor. 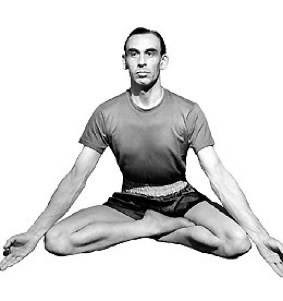 The posture isn't perfectly symmetrical. 3. Posture. Sit upright and stretch your spine as if you were trying to win a "who's taller" contest with your friend. Now relax and let go of that. You should be sitting upright comfortably without straining. I put my hands on my lap. Nothing too fancy. Eyes are open and fixed on the floor in front of you. 4. Listening to the breath. At this stage in my meditation practice, I've come to see why the breath is such a great place to focus. Meditation doesn't really have a goal in that sense that you're trying to produce a certain state of calmness or spiritual intensity or answer a question. It can help, but that's not the goal. In meditation, all you're doing is seeing what the breath feels like. It may sound boring, and sometimes it might be, but you'll see that it's actually somewhat interesting and a great tool to pry your heart open. Start right now. What does your breath feel like? You don't have to answer with a word, just experience it. That's the best answer you could really give if you could somehow share your experience. Does it feel warm? Tense? Shallow? Empty? Nothing special? Good? Tender? It doesn't actually matter what it feels like. There's no right answer. You're not trying to force it to be like something. You're just seeing what it's already like. 5. Thoughts. As you start, your mind will start wandering, speculating, checking your progress, making sure you're following the instructions correctly, comparing, contrasting, remembering, making plans, commenting, etc. When you recognize this happening, you don't have to get upset. You didn't lose or mess up. That's what the mind does. It's okay. Forget about it and go back to listening to the breath. Don't be a jerk. As you continue, your thinking will start to lose some of its force. Your mind will become concentrated and settled and your heart will start to peek out. Questions? Relationships and Buddhism: is there a conflict? Is taking a break a good idea?